The IPO (Initial Public Offering) Gold Rush just went into overdrive with Pinterest announcing plans to speed up its IPO in mid-April. The IPO market has been improving since bottoming in 2016, so there is a pin-up demand. Moreover, there is no doubt the successful debut of Levi Strauss is buzzing across corporate boardrooms around the country. Companies that were already committed to going public may be thinking about moving up their offering, and those that were only musing about going public are now giving it greater consideration. Just think of all the names going public that have become household names. They are services and products that change the way we do business, travel, and vacation. It’s remarkable. There will be a feeding frenzy, not unlike the late 1990s into 2001. There is a glaring difference. These are real companies, not ideas that came to life a few weeks earlier during a conversation at a bar. Those ideas, often written on the backs of napkins, came to life so quickly that it was bewildering. Back then, everyone was going to buy up a bunch of tech stocks, including back-of-the-napkin IPOs, and retire before age 40 to a personal island. I used to look at prices for a personal island all the time - I bet you did as well. The question is whether the market can handle the sheer volume. Currently, it’s estimated 234 companies will go public this year. 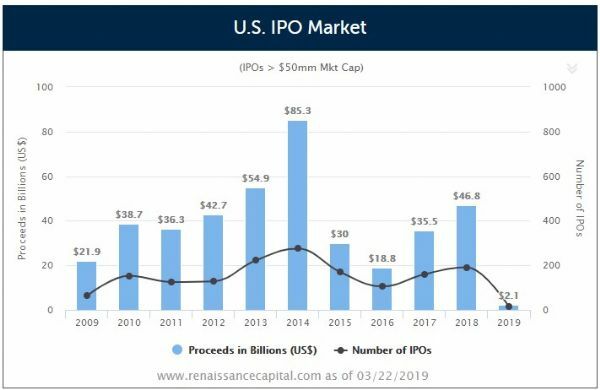 While that’s nowhere near the 406 IPOs in 2000, the amount raised will surely shatter the $96.9 billion raised that year. I think these deals are going to sizzle, but I worry about investors that aren’t nibbling, overpaying and sitting on a loss when the fireworks fade, and all the confetti is swept away. I took my own company public and know the extra regulatory burdens, but for founders, it’s the ultimate way to cash out and create a perpetual money-making machine. It’s individual investors that are taking all the risk, so keep that in mind when chasing the latest hot IPO.